When I designed Lost Patrol I was limited to the models that were available. This means that the Space Marine Scout squad in the box used the sprue of models that was around at the time. This included a sergeant and a heavy trooper, but no sniper. Everyone knows that the snipers are the coolest of the Scouts, and I had a nice, simple way of adding them into the game, so here I am. 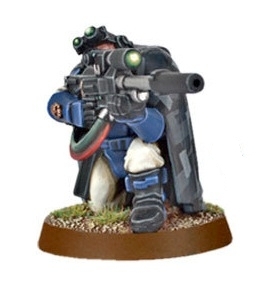 At the beginning of a game, the Scout player can choose to swap the heavy bolter Scout for a sniper instead. This means that you will need to find a Scout sniper model. I just bought one on Ebay as I particularly wanted a pose from the old metal range. If you already have a Space Marine army then you’ve probably got some anyway. moves and fights in ambushes like other Scouts. can shoot at any hex he can see other than the hex he is standing on (which he cannot shoot at). This includes hexes that contain other Scouts. gets 1 dice per shoot action and kills a Lurker on a 2+. It’s nice to finally be able to kill Lurkers reliably! Unfortunately, this might be a bit of a trap. The objective is not to kill Lurkers – there are an infinite number of them anyway, and only 5 Scouts. You need to be getting away. By taking the sniper you gain the ability to kill at a distance, and fairly reliably take 2 counters off a stack each turn. There are times when this can be vital, especially if you can remove the last one of a stack so that it cannot be grown. You can, at times, blast a clear path for others to exploit. On the other hand, you lose the ability to influence ambushes at a distance, and as ambush is often where the game is won and lost this may be more important. But shootin’ stuff is fun! Overall the sniper is an interesting variation rather than a major alteration of power between the forces. Using the sniper rather than the heavy weapons Scout requires an adjustment of tactics on both sides, and adding fun tactical variations is most of the point here (the other bit is finding excuses to use cool models). This entry was posted in Lost Patrol. Bookmark the permalink. I don’t believe this game is still alive.I have a copy from the old days, and I had great time with this. I love the sniper rules, and I see more cool stuff is coming !!!!! It’s alive for me anyway as I still play it. Lost Patrol is one of those that lies dormant for months or years, and then gets played lots for a while before resting again. It’s always well liked when it comes out though, so I thought some more variation might be fun. May you please try and do more Lost Patrol rules like this?